Hey, are you down there? Hole in the first grow bed. What started out innocently enough about a month ago has evolved to Caddyshack proportions. 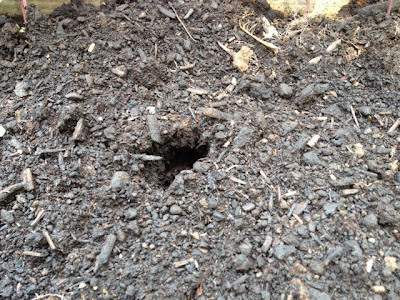 Moles have been carving their way around the back garden, taking out some plants in the process. Even though they don't eat the plants (I suspect they are more likely after my worms then the grubs even), the process of moving the plant out of the way of his tunnel has caused one of my winterberry bushes to (half) die, and might actually be responsible for the tomatoes dying off in the back yard (or, it could be our friend, the wilt). Nevertheless, I truly regret not stabbing the earth when I saw it move that day a couple of weeks ago. I got sick of trying to dodge the tunnels and went to my local Agway yesterday and bought the organic Holy Moley Mole Repellent (derived from castor oil) to hopefully drive the critters away from my yard and back under the fence into the overgrown woods behind the house. But what I wasn't expecting was for the moles to partially vacate the backyard, cross (tunnel underneath??) the patio and driveway, and start meandering through my veggie grow beds along the driveway. So last night I applied the treatment to the front lawn that has no activity. The repellent says (in my shortened summary): "to apply it to the area not yet affected, then the second day apply to the affected area, and then on the third day, apply it everywhere!! Everywhere!!!" I think they forgot to include the evil laughter. Anyway, for good measure I tried my father-in-law's mousetrap trick again, only to be foiled by the ants. They carried all the bits of peanut butter away. Today I moved the trap next to one of the holes and placed a bucket (without air holes) on top with a brick. It's a weak attempt but it's worth a shot. Over on Facebook, I'm being advised to buy windmills, vibrating sticks, chew and deposit Juicy Fruit gum in the tunnels and to buy Grubout (it's not organic so I won't be purchasing it). A search on Amazon led me to a Victory trap that if I'm pushed a bit further, I might actually entertain the idea of buying and using. I really could do without this drama!